It’s our pleasure to let you know that the PFAFF® creative icon™ has won the prestigious “Red Dot: “Best of the Best”, design award! The “Best of the Best” award means that the creative icon™ was deemed to be one of the best designed products globally launched in 2017. Only 69 products, or 1% of all nominated entries, have received this award. This includes products from categories as wide as lamps and garden furniture, to ships, planes and trains. We have won in the category “Household appliances and household accessories”. This category includes vacuums, washers and other large house hold appliances. The origins of the Red Dot Design Award date back to 1955. Its distinction, the Red Dot, is established internationally as one of the most sought-after quality marks for good design. With the help of the jury, the internationally organized competition “Red Dot Award: Product Design” appraises the best products of the year. In 48 categories, manufacturers and designers can enter their innovations. The jury only awards a Red Dot to products with a high design quality. 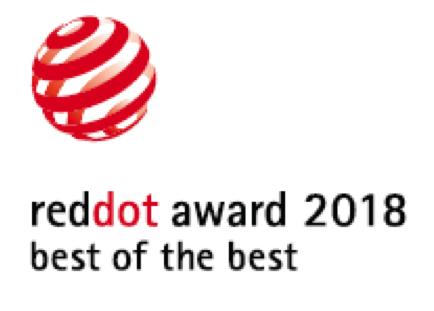 The best products of a category are awarded the “Red Dot: Best of the Best”.